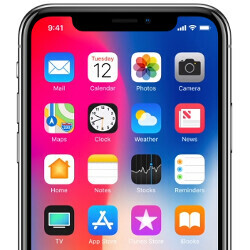 The Apple iPhone X made its debut during the fourth quarter of 2017. The tenth anniversary model launched during the first week of November, which helped Apple's U.S. market share rise sequentially by 10 percentage points during the last three months of the year. For the period, the iPhone saw its share of the stateside smartphone market rise to 39% from 29% during the third quarter. On a year-over-year basis, the iPhone's Q4 market share was up 5 percentage points (17%) from the 34% it achieved in Q4 2016. Apple had a seven percentage point lead over Samsung from October through the end of last year. Sammy's 32% slice of the U.S. smartphone pie placed it well ahead of LG's 13%. All of the remaining manufacturers together owned 15% of the U.S. market. Much of Apple's strong fourth quarter can be credited to the new iPhone X, which has increased the rate at which Android users switch to iOS, and the rate of iPhone upgrades by existing users. No matter which analytical firm ran the numbers, the data showed that the iPhone had a strong fourth quarter. For example, in the week leading up to Christmas, Apple dominated new device activations while another report showed that the top three selling smartphone models in the U.S. during November were the 2017 iPhone models (iPhone X, iPhone 8 Plus, iPhone 8). That just the us market, I want to know total sales figures. This is the most phones apple has had at one time from their strongest quarter and strongest market. Piyath and other Apple users are too ignorant to see that Apple has 39% of the US market share. While 61% of the US market is Android for Q4 2017. Why doesn't Apple or Phonearena post the rest of the worlds Apple market share? Would it show a decline in overall market share? Also posting that the iPhone X is leading the way. Well that is just some hype, especially when you look out there. I see very few iPhone X's. BTW, Apple announced it sold a record 78.29 million iPhones in the October-December period of 2016, up 5 percent from a year ago. So how many iPhones did Apple sell this time around? That is the true figure. Not this US only figure. It's still good, but don't forget Apple is global, and the US is Apples largest market in the world. Just try to accept that iPhone sales are very strong. We just got numbers from around the world, kantar is giving them every month. Why you put Apple numbers down so much? And try to find a negative from it, it looks very bitter to me. My prediction is that iPhone sales this q is around 84 million and thanks to X their ASP will be very high. Wow midan. Those kantar smartphone market shares showed that Android's market share Rose in the USA, and that iOS fell. Thanks for proving my point. Kantar showed that iOS dropped globally but Rose in China and Germany, but Android rose everywhere. So this is just like I said, more pumped up hype. If the iPhone X is doing so well. Why are we seeing BOGO deals for a device that only came out in November? Please midan you and a bunch of Apple zealots will jump at anyone to pump up the Apple cause. Why are you comparing one company to all others combined? so what if android growing? what are you trying to prove? We all know that android companies except few are doing very badly in the market. again why you put Apple down so much? i wonder what you say next month when Apple announce huge new record? Does market shares matter if at the end. If the day the walk away with all the profit?? Lol read what you post Midan. Your post helps to prove that Android gained while iOS fell. Thanks buddy. Lol. According to mixpanel realtime stats, X share is growing lot faster than any other iPhone. What are the apps that mixpanel uses their sdk to leak usage information? Like I've said before, Apple knows how to get bank. I can't hate on them for that. Just wish the X was worth the prices they charge for it, craigslist came thru for me. Iphone x has a pretty screen. Wonder how the next quarter will be. What share would it have got if it didnt have the notch? Great for Apple however as a consumer not relevant to me at all. I'm not a cheerleader of any corporation. If I need info for investing in a stock, phonearena wouldn't be a site I'd visit for info. Kudos to Apple though. Sprint lease sales are helping. Considering these stats are accumulated before then, and the fact that Sprint is the LEAST popular of the four major carriers, I highly doubtful that. It's so funny that the people who claim to hate Apple, spend so much time arguing about sales and hoping the iPhone X fails, etc. Ya'll sure do give Apple lots of attention. Let’s get that x plus model out. The current X is a tad small. Hope the plus version isn’t much bigger then current plus models in over all size. Just nice big screen for media. I'm trying to understand how a phone released in the 4th quarter of the year, namely October through December, had any bearing on Apple Q4. PA your title says Apples Q4. The phone was not released in Apples Q4. The X was announced on the September 12th. Preorders started October 27th which is in Apples 1st quarter. Carries can't preorder devices until the same day we all can. So how did iPhone X influence Apples 4th quarter when it wasn't released until Apples 1st quarter? You try to be too clever, these stats aren't Apple Q1. That's different thing. This was quarter for all not just for Apple so Yes it's Q4.